Wait, The GameCube's Pikmin Could Run In Windows? In today's installment of "things I wish I'd known in 2001" comes this page on The Cutting Room Floor, via Brandon Boyer, which both outlines the fact the original Pikmin on GameCube could run on a PC, and shows you how to do it. Turns out there's a Windows executable file on the wee disc, and running it (after some prep work) will boot the game in a debugging mode. 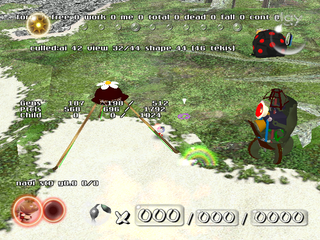 Things are messed up, and there's debug info all over the screen, but hey, it's Pikmin, on your PC, running off a GameCube disc.